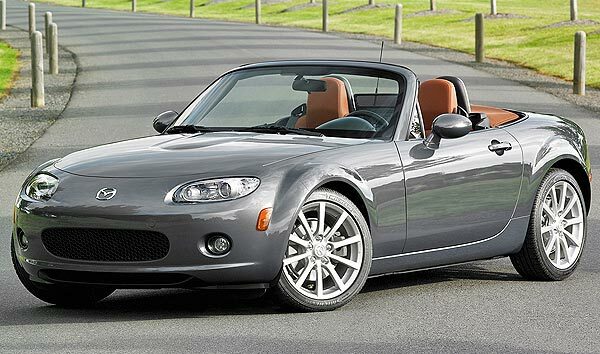 MAZDA MX-5. Perfectly balanced, light and incredibly reliable, makes it the two-seat sports car world's most popular. It starts at only $22,960. Summer is here and the desire to drive a convertible sometimes faces against a myth: All convertibles are pretty expensive. Here, we will show you that's not entirely true, so for that reason we are presenting the cheapest new convertibles you can buy or lease for this coming summer. Convertible, cabriolet, transformable, targa, coupe-cabrio, etc., are all different names that evoke the same type of car. Although there are different types of roofs such as hood hard, manual or automatic, faster, slower, more sporty, more expensive, cheaper, etc., they all were created with the same philosophy: "enjoy open-air driving". This Lexus mounts a retractable aluminum hardtop that only needs 20 seconds to make the IS a coupe or a convertible. The new 2011 Volvo C70 has an aggressive style without ceasing to be extremely elegant maintaining its quality and safety. Thanks to its GT 3.8L engine, the Eclipse asserts its power performance on the road able to challenge any route. More powerful and more efficient. With its 305 hp and its 30 mpg on the highway it becomes a really efficient car. The Eos convertible comes with an upgraded exterior design and improvements bringing it closer to new DNA of the brand products. It comes with a base V-6 engine that produces 312 horsepower, which would compete well against the Ford Mustang on the road. This is the convertible version of the formerly known as Chrysler Sebring, which has a very distinctive rear view. It has an elegant interior and sport with speedometer in the center position. The Mini Cooper Convertible offers a great number of customization options. The small "city car" is a vehicle designed for the big cities where traffic is abundant and the parking spaces are scarce. A convertible eliminates blind spots. A convertible facilitates passive multitasking. A convertible responds to your moods. A convertible has unlimited headroom. A retracted convertible top eliminates embarrassing phone calls. A convertible is great for a relationship. 2011 Smart ForTwo Cabriolet Review - Wondering how it feels to drive a smart fortwo convertible? This is the cheapest new convertible of the list which you can buy for less than $18,000 dollars.